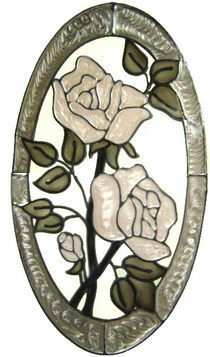 A more muted, antique-style version of the classic flower oval (ref. 51) with a touch of metallic colour. 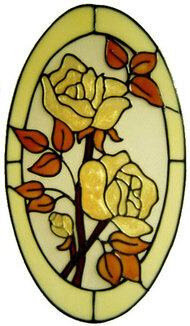 The clear background makes this wonderful as a traditional stained glass designs in doorways porches and entrance halls without the use of bright colours. Choice of colours for the roses - all other colours used will compliment your choice.